Easy homemade granola, flavored with cinnamon and pure maple syrup. 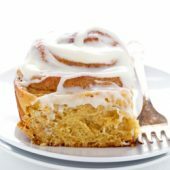 A tasty breakfast or snack! I’m a big fan of multi-purpose items. Some uni-taskers are okay, but I don’t want a drawer full of them. For example, I love my garlic press. So quick and simple, it beats mincing by hand and smelling like garlic for a day. Not that I mind the smell of garlic, but I don’t want to smell like it. And random items like strawberry hullers. Yup. Love them. They remove just enough, while leaving all of the good stuff and so much faster and easier than a knife too. This also applies to food. I love food that you can eat for a variety of meals or occasions. The best example is breakfast. Eggs anytime of day, eaten alone or on a wide range of items – from pizza to pasta and so much more. But the biggest multi-tasking food is bacon, by far. Breakfast, lunch, dinner and even dessert. I just need to find a way to enjoy it as a snack and I’ll be set! Have any brilliant ideas? Going along with the breakfast and multi-tasking food theme… oatmeal, or more specifically – granola. You can eat it as breakfast or snack and likely lunch or dinner if you really wanted. Breakfast for any meal is awesome. It’s the best meal of the day. My latest obsession is granola. I’ve always loved oatmeal, on it’s own, as a topping, in a bar or paired with other items. But, I never really got into it as a breakfast or snack until recently. Granola is quite possibly one of the easiest things to whip up. Requires minimal hands on time and gives tasty results! I’m a huge fan of using pure maple syrup as a sweetener. I paired maple syrup with cinnamon and brown sugar to create the perfect crunchy snack or breakfast treat! Fair warning, this will absolutely disappear before your eyes. My entire batch was gone the same day. Clearly we’re fans here and that means more delicious crunchy granola options coming your way. 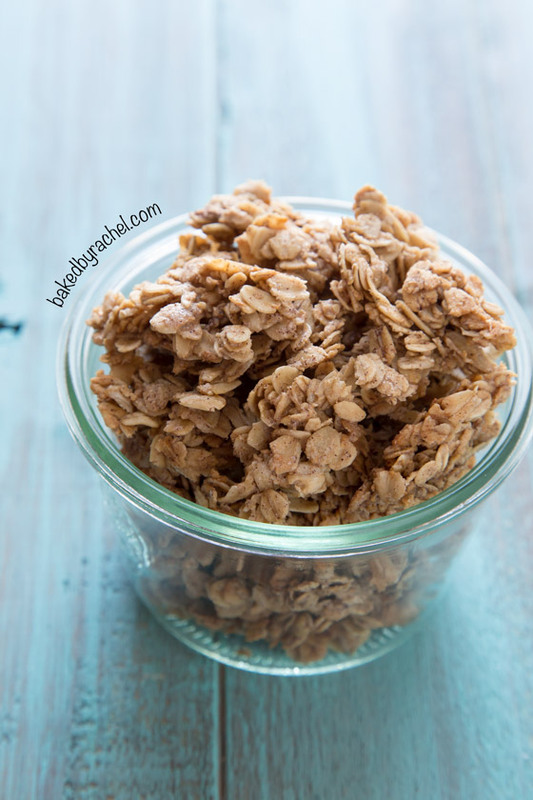 Until then… be sure to whip up this cinnamon maple granola to enjoy! I promise you’ll love it! Preheat oven to 325°F. Prepare a large rimmed baking sheet with parchment paper or a silicone baking mat. In a large bowl, combine all ingredients. Stir to coat well. Transfer oatmeal mixture to prepared baking sheet. Spread out into an even layer, pressing down to compress the mixture. Bake for 35-40 minutes. Remove from oven and cool, untouched, for 45 minutes. Break into pieces. Store in an airtight container for up to 2 weeks. I love the simplicity of this granola. It looks mighty tasty! This is absolute perfection – my husband eats granola every morning and would love this one. 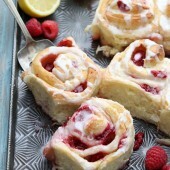 Love the simplicity of the recipe but would add nuts, raisins and cranberries! Will make! Thanks. 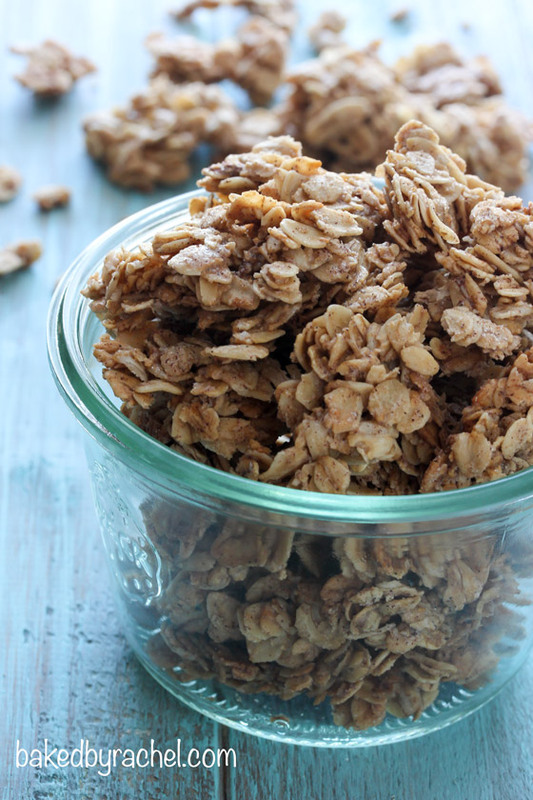 The simplicity of this granola is absolutely perfect. I want to top my morning yogurt with it! Homemade granola is the BEST!! 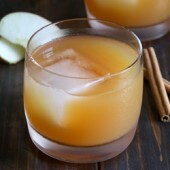 Loving the combo of maple and cinnamon in this! 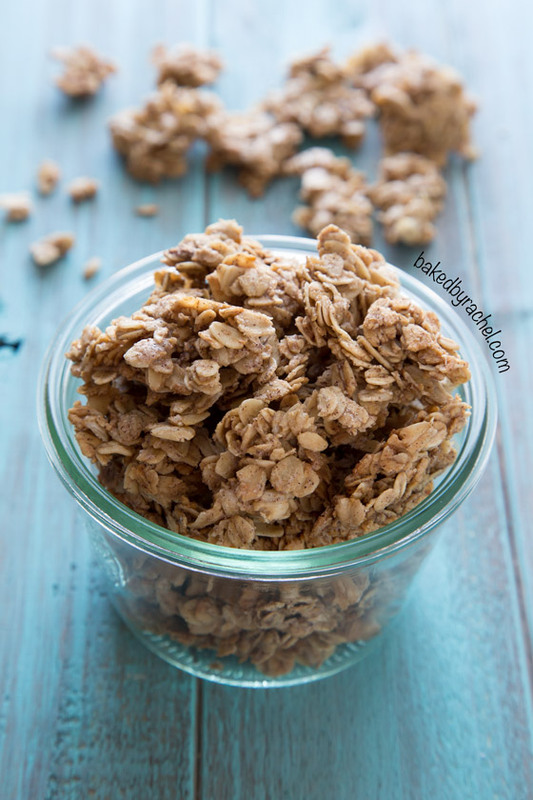 I love homemade granola, and this one looks like perfection! 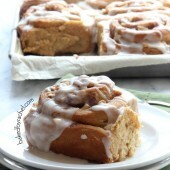 It’s so simple and delicious, would be great with pecans as well :) pinned! Sometimes I am so good at having granola on hand. And yes I will have it all day long. I love this kind and that you have clusters. I can never do the clusters. Mmm, homemade granola is the best! I am so excited to make this! So simple but so amazing! Funny – I posted granola today too! I have a major obsession with it. I’ve never liked oatmeal, but I love granola. I think it’s the crunch that gets me, I can’t handle the texture of plain oatmeal. 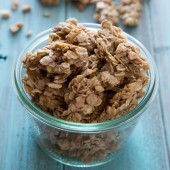 This granola looks amazing, I love the maple cinnamon combo – so good! Yum! That looks so delicious – I’m not surprised it was gone in a day! so much better than storebought. Thanks for sharing the recipe. So going to try this recipe. This sounds so good. Was wondering if you could sub coconut oil (melted) for veg. oil? I have made this several times (5 or 6) and it is so fantastic. 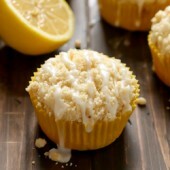 I add about 1/2 cup of sliced almonds always and some times I switch out 1 cup of the oats for 1 cup of Rice Krispie cereal (I noticed some packaged granolas had that so gave it a try when low on oats once and liked how it lightened up the texture little)….Anyway, this recipe is awesome. It is also a great one for kids to help with (my four year old loves to measure, dump and stir). Thank you! So glad you both have enjoyed it so much! And, I love your variations. This granola is amazing! Super crunchy, even in yogurt. I subbed the vegetable oil with coconut oil to add some extra goodness. 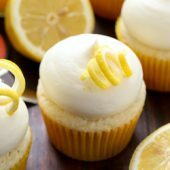 Thanks for sharing your fabulous recipe. Mmmmmmmm! I subbed coconut oil and added 1/4 cup chia seeds. Everyone in the house is full of granola! Thank you! This burnt!!!! 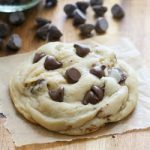 Oven temp too high in your recipe!? Everything is correct as written. Others have had great success. It sounds as though something went wrong on your end. It’s possible that your oven is running hot. I really love the simplicity. I added sliced almonds & subbed d sweetener w agave….. delicious!!! This looks delicious, but I have a couple questions. 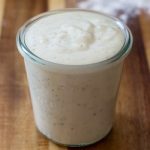 What is the difference between old fashioned oats and quick oats? 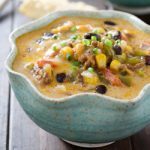 I only have quick oats right now, so will this recipe still work with those? Quick oats tend to be much thinner and smaller overall. They’re similar, but for most desserts, it’s best to use old fashioned oats (also known as rolled oats). I only had Quick Oats too, but I figured why not. 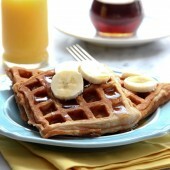 I also lightly whipped 2 egg whites and added sugar and syrup to melt and poured over the oats and Hoped for the best!! Deliscious! I promise to make to the recipe next time! BTW I picked up the egg white trick from another recipe, it helps it stick together better.